3 ripe plantains – look for deep golden color splotched with black. If you can only buy them green, ripen in a brown paper bag with an apple for 2-4 days. While oven is heating, lay strips of bacon, cut in half, on a non-stick or lined cookie sheet. Bake 2-3 minutes, just until soft and limp. Remove from oven, pat dry. While bacon is cooking, peel and slice plantains into thick ovals, approx. ½” thick. 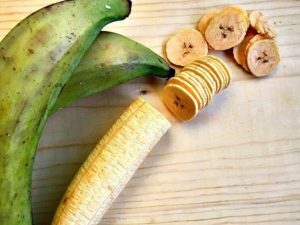 Lay down a slice of soft bacon, fold around slice of ripe plantain and secure with a toothpick. Set on cookie sheet so pieces aren’t touching. Bake 10-14 minutes, or until plantain is golden and bacon is crisp.